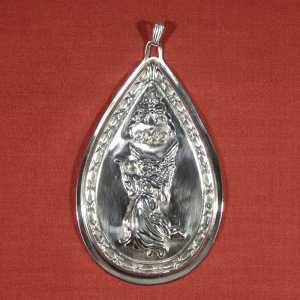 This Joys of Christmas sterling silver angel ornament, the second is a series of Waterford Fine Silver Gifts ornaments, features a special Christmas holiday scene. Joys of Christmas depicts a heavenly angel giving praise with sweet sounds of violin music. Crafted of quality sterling silver, this beautiful keepsake incorporates a delicate border design inspired by the classic Powerscourt fine crystal pattern by Waterford. Waterford Fine Silver Gifts offer a distinctive collection of truly inspired sterling gifts. Each creation is skillfully designed and painstakingly crafted by Reed & Barton Silversmiths to meet the exacting stands for which Waterford is world-renowned. 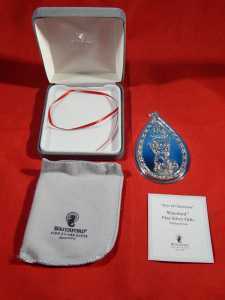 This Reed & Barton / Waterford sterling silver ornament has never been used, is in excellent condition, and comes with the original tarnish-proof gray cloth Waterford Fine Silver Gifts bag, a red satin ribbon and the original product card all enclosed in a hard, gray velvet presentation box - perfect for holiday gift-giving! The flat back of this Christmas ornament could easily be personalized or engraved by your local shop. Dated 2002. 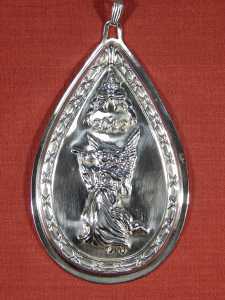 The collectible sterling silver Joys of Christmas angel ornament measures 4" x 2.5" and is marked on the flat back with "Joys of Christmas, Second Edition, WATERFORD Sterling and the Waterford seahorse logo. You can read more about the history of Waterford from our Manufactures pages.